Down At Dawn present a reissue of Doin’ The Thing At The Village Gate, originally released in 1961. 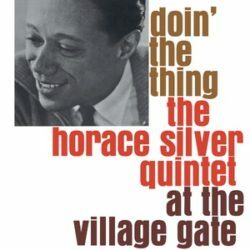 Doin’ The Thing At The Village Gate consists of a 1961 live recording featuring the great pianist and composer Horace Silver and his most acclaimed quintet with trumpeter Blue Mitchell, tenor saxophonist Junior Cook, bassist Gene Taylor, and drummer Roy Brooks. A strong four-track live set full of soul, funk, hard bop vibes.